*Great Ocean View ! * higher floor NOT Intracoastal View. Amazing deluxe owner residence suite, the "Gabbana " At the the newest and Hottest Resort on South Beach "
A lovely and bright apartment, in a perfect location, owner operated, with many extra residence privileges. Located at 102/24th street, Collins Ave South Beach. Please check out our verified reviews, from previous guests, to give you reassurance your booking a five star property. The Premier Partner Program recognizes owners who consistently deliver outstanding traveler experiences and the Premier Partner badge shows travelers that they can expect a great stay at our property very few owners achieve the badge. Sleeps 4 Adults or 2 adults and 3 Children. Very spacious one bedroom with balcony, 1000 sq ft of living space, with a 120 sq ft furnished balcony. Enjoy fresh sea breezes and a beautiful ocean view from the private balcony, of this elegant one bedroom home, we have three Ocean view suites, if you require an additional suite or your dates aren't available. Upgraded luxurious furniture design from the standard units professionally interior designed. Direct unobstructed views overlooking the ocean from the residences, lobby designed by acclaimed Brazilian designer Debora Aguiar. This is a premium one bedroom in that it is on a high floor, with resident privileges, you also receive hotel privileges just as if you were staying directly through the hotel. Hotel amenities include 4 pools, New Anatomy gym, New fantastic 5* Bamford Haybarn spa, the first in the US, 4 onsite restaurants, valet service 24 hours a day, even free Tesla car service. There are restaurants and shops minutes away, we have a fully equipped full kitchen while the hotel do not have full kitchens our apartments are larger. Refresh with a triple-filtered water shower and custom luxury bath products made with naturally derived ingredients. We offer free phone calls within the USA and Canada and fast Wi-FI with full Cable Television. This beautiful 1 bedroom, 1 bathroom suite has a sleeper sofa with a queen size memory foam mattress in the living room, blackout blinds and curtains in both rooms, luxury king size bed in the large bedroom , allowing for up to 5 guests comfortably, expansive floor plan layout provides opportunities for gracious living. The suite is equipped with a 55-inch Samsung smart flat-screen television in the living room and 48" Samsung smart television in the bedroom.Bluetooth speaker dock to stream music from your phone. Fully equipped kitchen and top end appliances, in-room three stage water filtration system for fresh drinkable water straight from the tap. This interior designed furniture package is top of the line. Everything is included with a dishwasher, microwave, disposal, washer, dryer with child safety features. One car valet parking at hotel rates, private access through the beautiful residents lobby, free parking for stays of thirty days or more. Located in THE best spot, in the heart of South Beach next to the W and Setai hotels, steps from Miami’s best restaurants, cultural centers and retail boutiques. The friendly concierges are available from 7am to 11pm daily in the lobby, to offer recommendations and give directions, or for booking the hotels complimentary car, local restaurants etc, they can also work with you to organize other natural experiences or make reservations for you at South Beach’s top nightclubs, eateries. Other services include boat, bike and scooter rentals, fishing and yacht charters, organized water-sports, inside tips on special events and even babysitting for when you’re ready to take on miami after dark . Occupying the entire oceanfront block of Collins avenue, between 23rd and 24th streets, It puts travellers in an ideal position to take advantage of everything South Beach has to offer, while staying slightly out of the fray for a quiet night’s sleep. Miami beach convention centre is 15 minutes' walk from the property. Resort Access - Enjoy resort access at your fingertips. The following items are included in the daily $39.90 resort fee, per room, applied at the time of check in: Two pool & beach chaises, per room umbrellas, fresh towels, beach activities including beach paddle tennis, frisbee, boogie boards, skim boards, soccer balls access to the business center and use of the hotels free Tesla car service. Even Yoga classes on the rooftop are included and gym classes. Booked an early flight or have a late flight departure? The front desk will gladly stow your luggage safely and securely, until you’re ready to move on,you can continue to use the amazing facilities, pools restaurants and showers. The Main Pool Deck is the hotel’s most popular space and literally the center of the hotel. With over 30,000 square feet of space, with cabanas, day beds, all the things needed for a day of fun. Best of all, 180-degree ocean views. The Cabana Pool Deck hosts a swimming pool that converts into a hot tub, eight cabanas,two ultra cabanas and ocean views. The Rooftop pool lets you take a break from the vibrant energy of Miami. Relax in the cabanas with built-in champagne buckets. You’ll enjoy the tranquility and feel comfortable knowing that the area is adults-only 21 years minimu. As the only oceanfront hotel in South Beach with a rooftop pool, makes it special and serene. The largest event space, the South Pool Deck gives our guests more than 40,000 square-feet of rest and relaxation. 1 level down from our Main Pool, this is the largest pool at the hotel and closest pool to the ocean. Experienced and beginners are welcome for a refreshing start to your day! Held on the east end of The Rooftop every Sunday morning from 9:30am - 10:30am free to our guests. SoulCycle, the country’s premier full-body indoor cycling studio, features a 2,600 sq. ft, 54-bike studio, home to the signature SoulCycle workout. The full body indoor cycling workout incorporates weights and core exercises into the 45 minute classes. Designed for fat burning and strength training. Directly in front of the Hotel and just steps from the Main Pool, enjoy 600 feet of beautiful beachfront. Relax, lay back and soak up the sun on one of our chaise lounges - if you prefer the shade, umbrellas are available too, the expert wait staff serves food and beverages to your liking, as well as plenty of towels and sunscreen. 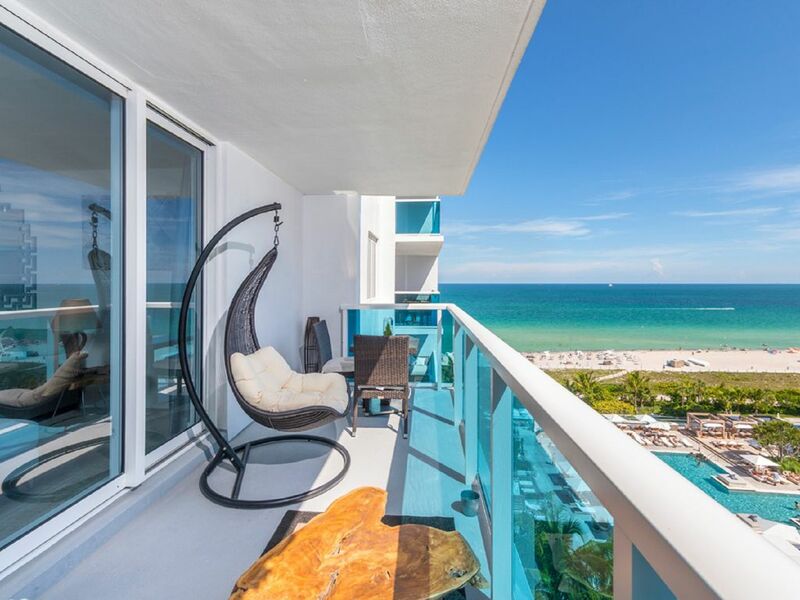 You're perfectly positioned at the private 600 foot long beach club, with direct access to the pools at the Hotel and a quick few steps from the equally abundant oceanfront right on South Beach. Dig your toes in the sand, relax in a hammock underneath the seagrape trees or play a friendly game of volleyball. Located on the second level of the hotel, the Cabana Pool offers panoramic views from anywhere on the deck. Expert wait staff serve food and beverages to your liking, as well as plenty of towels and sunscreen. Offered at an additional fee. While you take time for yourself, your children will enjoy a variety of activities and adventures, focused on bringing the children closer to nature while educating them on the world we live in and the importance of taking care of it now. At the same time, they will be having a lot of fun! At the hotel, brings Tom Colicchio’s seasonal sensibility to Miami. Colicchio collaborates with executive chef and South Florida native Michael Fiorello on a menu that features pristine, locally caught fish and antibiotic-free meats accompanied by vibrant produce. An expansive, open kitchen anchors the restaurant, where fish, seafood dishes and vegetables are center stage. A fully stocked raw bar, salads, flatbreads and freshly made pastas round out the experience. The ground floor features the 85-seat dining room, outfitted with natural materials such as wood and stone, bronze lighting, caramel leather banquettes, an expansive, concrete-topped bar with seating for 22 and an outdoor patio. An open kitchen in the rear of the restaurant invites guests to experience the action while enjoying their meal, while an adjacent private dining room on the main floor provides an ideal setting for intimate dinners and celebrations. ur Farm-to-Bar Lobby Bar, Tom on Collins, serves a well-curated selection of local beer, wine-on-tap and crafted seasonal cocktails. A menu by Tom Colicchio, composed of easy-to-share snacks, flatbreads and small plates will be perfect accompaniments. Enjoy cantina-style poolside dining by Tom Colicchio, with freshly made antojitos, tacos, brochetas and tortas at The Sand Box at the Main Pool. Refreshing seasonal cocktails, fresh juices and cold drinks will be available. Escape to an oasis above the lights and sounds at The 1 Rooftop. Day or night, float 18 stories above Miami while gazing at 360 degree views of South Beach's beautiful oceanfront, and the expanding Downtown skyline. The Rooftop Pool is reserved for Hotel Guest and Resident guests use during daytime hours and is open to the public after 6pm for dining, the bar and lounge.The Rooftop is an adults only area. The reason our guests leave such fantastic reviews, is that you have all the facilities of the amazing 1 Hotel, the owners and their guests also have their own private entrance lobby, and enjoy residence privileges. For instance use of the Hotel Tesla cars, and residence staff at call throughout your vacation, it makes, your stay very special :) We also have a great attentive local rental agent, who will look after all your needs. Full eco friendly Air Con. Fast WIFI provided by Hotwire. Custom kitchens with built-in lighting designed by Debora Aguiar and created by Italkraft feature stainless steel appliances by Sub Zero and Bosch,Grohe fixtures and Kohler sink basins.Bosch washing. Miami Beach Golf Course 1.3 km. Four Pools including stunning rooftop pool and restaurant-bar with panoramic views of the Atlantic Ocean and Miami City Skyline.The Main Pool Deck,The Cabana Pool Deck, The 1 Rooftop, South Pool Deck. Free Pack and Play Crib. Free inflatable bed if required. Resort fee per room at hotel rates, currently $39.90 per day payable directly to the Hotel. Picture ID required on booking. Checkout Cleaning $150.00. Daily cleaning optional, ask owner for rates. Valet Parking for one car, at Hotel rates currently $45.15 per day, payable directly to the Hotel. My wife and our 2 friends enjoyed our stay at Natalie’s condo. Everything was provided for us, the condo was spotless and the view from the balcony incredible. Robinson met us and answered all our questions as we usually stay at Ritz-Carlton’s and this was our first time using VRBO. The hotel itself has a outstanding gym and the rooftop pool was the best! Great views, ample space and comfortable bed. Resort amenities terrific. We had an amazing time in this high end suite in a great Hotel. Exactly as described the pictures don’t actually do the apartment justice. Immaculately clean, beautifuly furnished and very spacious. Loved everything about it! the pools beach and restaurants. The 1 Hotel is world class and the staff very friendly, amazing restaurants and service. Natalie was a great very responsive host. We have already booked again for later in the year the best apartment we have stayed in ever. Glad you enjoyed the Ocean View and had a good time in South Beach, and appreciated the size of the apartment. Hope to welcome you back. One Hotel Residence -- perfect! Thank you John, For such a great five star review! I am so pleased you had such a good time, and the apartment and amenities more than met your expectations. And Kind comments i will be sure to pass them onto Robinson. Hope to welcome you back to South Beach soon! The condo is fabulous with stunning views! Natalie, Joe, Robinson and everyone at the resort are awesome. We cannot wait to stay here again! We are located on the beach in a great spot, with its art deco architecture, world famous nightlife and enormously popular beaches, miami beach has a reputation for being one of the top vacation destinations in the united states. Known as a world-class beach resort for almost a century, south beach has some of the best shopping in the area, with many high-end designers opening stores there. Check out collins avenue, known for high end shopping and a buzzing nightlife; washington avenue, heralded as part of the designer district; lincoln road, a seven block strip of boutiques; and espanola way, a pedestrian mall whose architecture is reminiscent of a spanish village.While staying slightly out of the fray in our fantastic suite for a quiet night’s sleep, where you can wake up to a stunning ocean view. $39.90 daily Resort Fee plus tax, $40 car Parking fee plus tax, per day per property, not person, upon check in and registration for stays of less than 30 days, Picture ID required on check in.